Very creamy ice creams in Coconut, Ginger and Mexican Chocolate. CAPSULE REPORT: A superpremium ice cream in an egg custard base that delivers lots of creaminess and an invigorating elegance, without heaviness or an overabundance of richness. At 16% to 18% butterfat and just 25% overrun, we don’t know how they do it. Maybe it comes from that healthy Boulder, Colorado environment! In business since 1993 with regional distribution since 2002, since June of this year the company has expanded the distribution of its creamy ice creams, delivering a Rocky Mountain high from coast to coast. Boulder Ice Cream manufactures ice cream in the foothills of the Rocky Mountains, 35 miles northwest of Denver. Surrounded by natural beauty, this city of 100,000 also boasts a great superpremium ice cream brand called, not surprisingly, Boulder Ice Cream. It’s an old-fashioned, homemade-style ice cream using a slow churn process rotation, that does not whip a lot of air into the ice cream. The result is a creamier, richer and smoother ice cream. They say it’s “just like homemade,” but you still need the right recipe to make ice cream this good. The ingredients on the label are the same as Häagen-Dazs and other superpremiums—cream, skim milk, sugar, corn syrup*, egg yolks and flavorings (vanilla, cocoa, cinnamon et al). 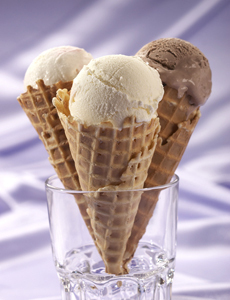 Similar to other superpremium ice creams, butterfat is 16% to 18% and the air content (overrun) averages just 25%. However, the ice cream is less heavy and sweet (in the bad sense) while it offers a beautiful creaminess. In our opinion, overly sweet, heavy and rich get in the way of enjoying the full flavor of the product. Boulder Ice Cream produces some surprising finesses, including that hard-to-perfect flavor, Green Tea. *Not high fructose corn syrup, but simple corn syrup, which helps achieve the right consistency in freezing. It also reduces the amount of processed sugar required. 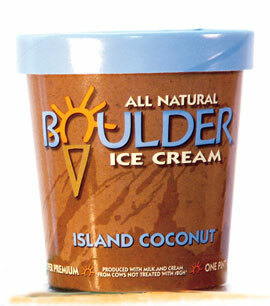 Boulder Ice Cream contains 100% all natural ingredients†. There are no preservatives, artificial flavors or colors: the Mint Chocolate Chip and Green Tea are both snow white instead of green. The Colorado milk and cream come from rBGH-free cows. †Some of the food service flavors, which may become retail flavors, have name-brand add-ins like Oreo and Heath Bar. Island Coconut is the number-one seller. Ginger Cream is light and sprightly—not the heavy buzz from Reed’s Ginger Ice Cream with its jumbo chunks of crystallized ginger (which we also love), but a more elegant, ladylike rendition. It would be wonderful on an apple pie or other fruit pie. Green Tea needs to temper just a bit—don’t eat it rock hard—and then it reveals the most wonderful flavor of matcha tea in a sea of cream. A delight. Island Coconut (the company’s best-seller) tastes like a coconut cream pie: not too much, just right, with a few shreds of coconut for accent. The sight gag is that all three of these flavors look just like vanilla: put a scoop of each in a bowl and you have white, white and white. The discerning eye will note that one of the whites has a slight yellow-green tinge, but maybe you’re only seeing things (it’s the Green Tea, proving that green tea ice cream is not actually green in color, unless it’s artificially-colored that way). One way to surprise your guests is to serve one scoop each of coconut, green tea and ginger, and let them be delighted at the array of Pacific Rim flavors. Cinnamon is charming by itself or with apple pie. We’ve said before that there isn’t enough cinnamon ice cream in America. Mexican Chocolate is a more subtle variety than Häagen-Dazs’ powerhouse rich and sweet version of the flavor. At first we were tempted to dismiss it. Then we grew to enjoy it for what it is: a delicious, cinnamon-accented chocolate ice cream. Mint Chocolate Chip is a lovely variation on the mint chip theme. We’ve had other versions that knocked our socks off—more of a profound mint and/or chocolate statement, e.g.—but we would never turn down a pint of this, and no mint chip lover would be disappointed. Famous Sweet Cream is another best-seller that we hope to catch on a return visit. Many more of the fourteen flavors are available in the scoop shops throughout Colorado, at other retailers, or by mail order from the company website. Along with the twice-weekly Farmers’ Market in the summertime, the annual Bolder Boulder Shakespeare Festival and the Boulder International Film Festival, don’t forget the Boulder Ice Cream Shoppe at 637 G. South Broadway. Telephone to check on the hours: 1.303.494.2002. When it’s warm enough, you can sit on the back patio with your ice cream and enjoy the view of the Flatiron Mountains, foothills of the Rockies. When it’s snowing, scoops are just $1.00. There is a store locator on the website. 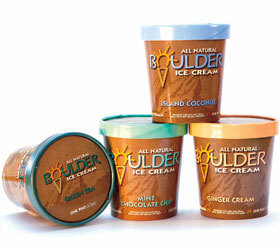 Currently, Boulder Ice Cream is carried by five regions of Whole Foods Markets (two on the West Coast, one Southwest, the Rocky Mountain Region and the Northeast), Wild Oats in the Western regions, Albertson’s, King Soopers (Kroger) in Colorado, Earth Fare in North Carolina, plus smaller chains and specialty stores. Ice Cream Treats, by Charity Ferreira. Recipes, a buying guide and tips on the basics, such as softening and shaping ice cream. 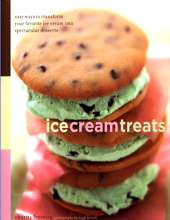 The book also contains recipes for homemade ice cream in traditional flavors like coffee, dark chocolate and vanilla bean. Click here to purchase or for more information. 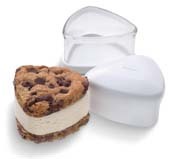 Cuisipro Ice Cream Sandwich Maker. Take your favorite cookies, your favorite ice cream, and create...heaven. Make perfectly-formed ice cream sandwiches every time. Click here to purchase or for more information.